I believe every person is entitled to have one weird, quirky obsession. Something they love for reasons even they don't understand. Many times, those little obsessions manifest in large collections... or in the beginnings of large collections. I think Eric's quirky little obsession, aside from his affinity for checkered slip-on Vans, is old fashioned globes. Since we moved into our house eight months ago, Eric has come home with three different globes. Our first, this awesome beauty that now lives in the guest room. 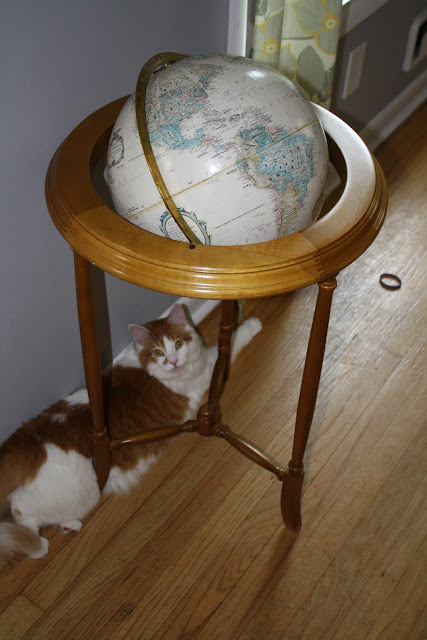 The second globe Eric brought home was this one, perched atop on a tall stand in our living room (and above one very geographically-curious feline). Last week, we became adopted parents of yet another old globe. But this one, she plugs in and GLOWS. Though I have no photographic evidence of the soft glow it provides, I assure you, the world looks beautiful beaming from a warm, golden light within. However, my story today isn't exactly about this new globe, rather what it sits atop of. Along with the globe Eric brought home, he also brought this old wooden box, with a sweet little "Snoboy" label worn on the side. Aside from globes (and the slip-on Vans, of course), I'm beginning to think we'll soon be collecting a hoard of old, wooden boxes. Which is fine with me. Anyway, because we're such fans of the "old meets new" look throughout our house, Eric had a grand idea to dress up this tattered box with some shiny new casters. He went to Home Depot (and since has declared that a Sunday morning spent at Home Depot is man's purest form of ultimate relaxation and simple joy) and picked up four inexpensive casters with gray wheels. Then he disappeared to the basement for a day and a half. When we reappeared, he had watched about 14 games of collegiate and professional football, and he had also affixed the casters to the bottom of the Snoboy crate. Then, Snoboy came to find his new home in the "quite vintage" corner of our living room. 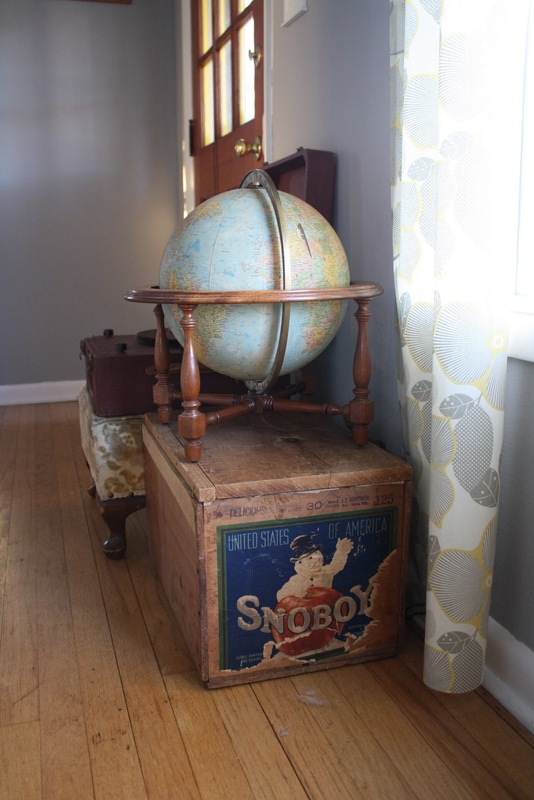 He met his upstairs neighbor, Glow Globe, as well as Victorian Footstool and Old Record Player. Together, they make quite a fine group of old souls with lots of life stories. Back to the Snoboy: I'd never heard of the Snoboy brand before, and was curious to see just what it was about. My dear friend, Sir Google, has informed me Snoboy has been trademarked since 1925, and is "a symbol of quality and freshness. . . a nationally recognized brand for fruits and vegetables by grocers, retailers, and consumers alike." The web site also boasts that the Snoboy "has become such a recognizable icon that the Snoboy character has been used on a range of premium and specialty items and is also one of America’s most recognizable brand characters." News to me. Do any of you regularly purchase Snoboy products? Further evidence that the Internet is the most supreme source of knowledge to all humans everywhere (with available service to the World Wide Web), Snoboy's web site also informed me that this crate, because of the original Snoboy logo affixed to the side, was made sometime between 1925 and 1960. So there you have it - we've defaced an historical artifact with shiny, Home Depot wheels. Either way, I doubt we'd be taking home much cash if we brought the pre-wheeled Snoboy box to Antiques Roadshow, and it looks awfully spiffy in our living room, so I'm fine with our little "upgrade." And I'm sure there are many more old, wooden crates where this came from... don't be surprised if, in a year or so, Mr. Pancakes will be forced from the house to make room for more crates that we can sit more globes on top of. Sorry, little guy. I find it fitting that this post is about Snoboy, and we are having the first snow storm of the year. I'm not really into collecting anything, but I love the idea of old boxes - there is so much you can do with them - use them as a nightstand, storage, a globe table, etc. I applaud Eric's collections as I also love globes. We have one that lights up as well, and it's in the nursery. One of my favorite things about the whole room! Hmm. Looks like I need to find me some old wooden crates. I like the way Snoboy looks!